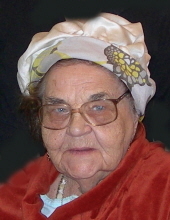 LYDIA ZARYK age 90, passed away January 12, 2019. Beloved wife of Alexis (deceased); dear mother of George (Linda), Valentina Sopko (George) and Gregory (Christine); loving grandmother of four and great-grandmother of four; dearest aunt of many. In lieu of flowers, the family suggests contributions to United Cerebral Palsy of Greater Cleveland,10011 Euclid Ave., Cleveland, OH 44106. Friends may call at THE KOLODIY-LAZUTA FUNERAL HOME, 5677 STATE RD., PARMA ON THURSDAY, JANUARY 17 FROM 4-7:30 P.M. FOLLOWED BY A FUNERAL SERVICE AT 7:30 P.M. Inurnment at a later date. To send flowers or a remembrance gift to the family of Lydia Zaryk, please visit our Tribute Store. "Email Address" would like to share the life celebration of Lydia Zaryk. Click on the "link" to go to share a favorite memory or leave a condolence message for the family.